The Beautiful Butterfly On The Leaves. 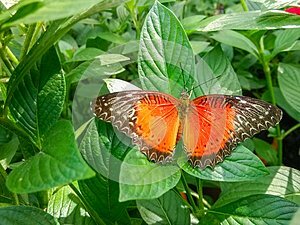 Photo title: The beautiful butterfly on the leaves. The beautiful butterfly on the leaves.Taken in the qingqing world of shenzhen.The butterfly`s whole body is red and yellow, with a jagged pattern on its edge. The sun shines on it, making it stand out.